Hello! I'm back today with the Make and Take cards from September! Here is the first one. This one has lots of layers, but looks wonderful all together. But it's not too bad, just take it one step at a time. Cherry Cobbler card stock 3-1/4" x 4-1/2"
Whisper White card stock 3-1/8" x 4-3/8"
Trim the Tree DSP 1" x 3"
Start off by using the Confetti Stars Border Punch along one long edge of the smaller piece of Whisper White card stock. Then run this piece through the Big Shot in the Lucky Stars embossing folder. Use glue stick to adhere this onto the Cherry Cobbler card stock. Now fold your Whisper White card base on the score line and use glue stick to adhere the stars/Cherry Cobbler layer onto the card front. 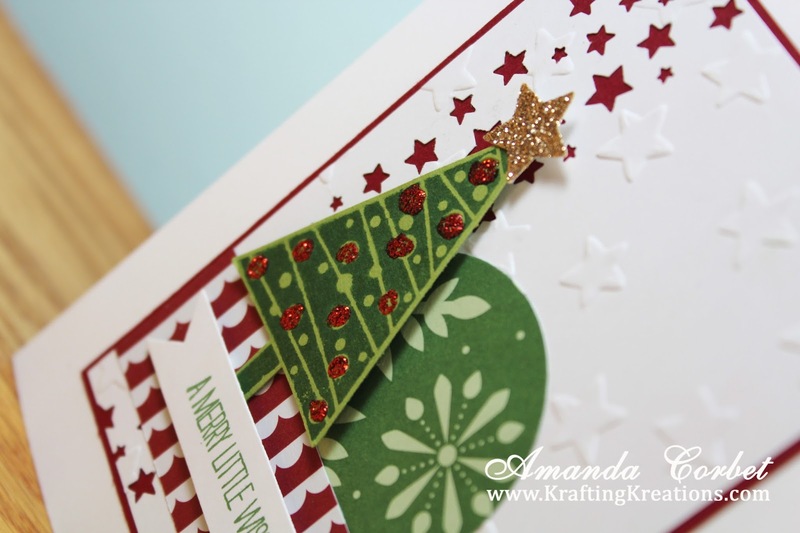 Use the 1-3/4" Circle punch on a scrap of Trim the Tree DSP and glue the circle onto the card front. Use Paper Snips to trim one end of the DSP banner into a dove-tail shape. Now glue this onto the card front. Stamp the tree image from Festival of Trees onto a scrap of Old Olive card stock in Garden Green ink. 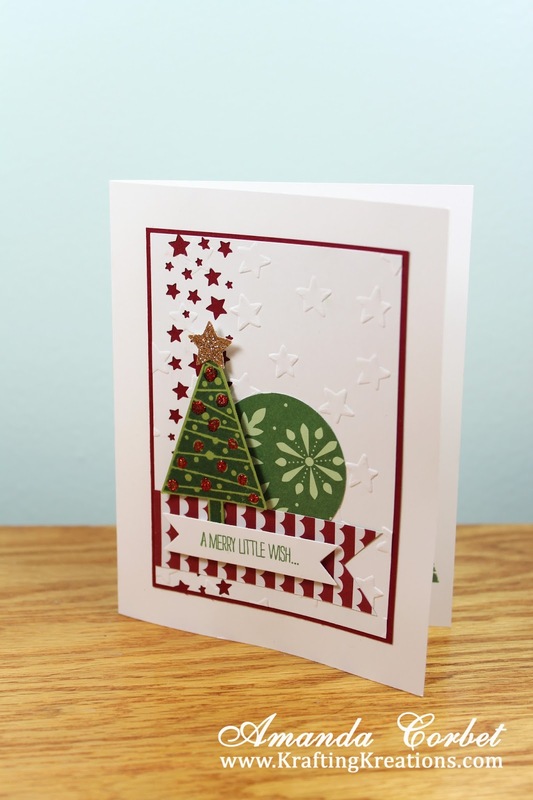 Use the Tree Punch to punch out the tree and add it onto the card with a Stampin' Dimensional. 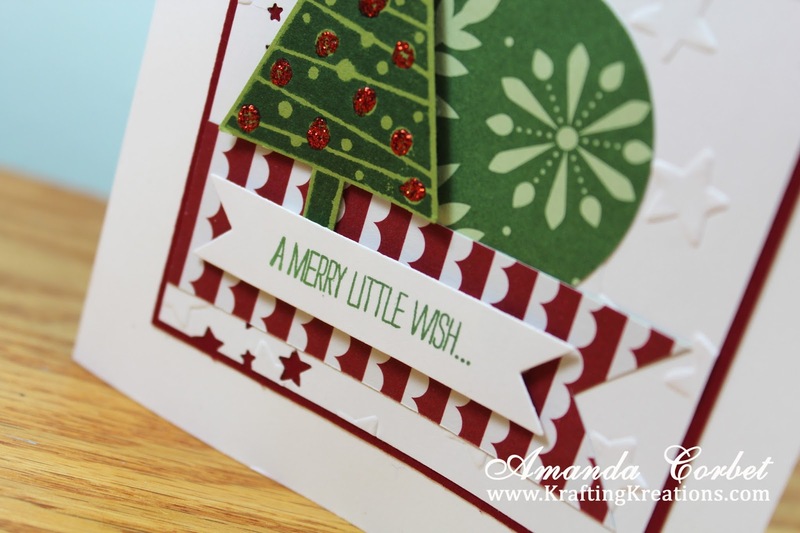 Use the small star punch from the Itty Bitty Accents Punch Pack on a scrap of Champagne Glimmer Paper. Glue the star onto the top of the tree. Now stamp the greeting from Festival of Trees onto a scrap of Whisper White card stock in Garden Green ink. Use the Bitty Banner Framelit in the Big Shot to cut out the greeting and stick it onto the card front with a couple Stampin' Dimensionals. Finally add Cherry Cobbler Dazzling Details onto the ornaments of the tree and allow it to dry completely. I just love all the layers on this!